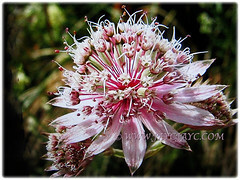 Greater Masterwort or Melancholy Gentlemen produces unique and gorgeous flowers that come in a wide variety of colours. Its group of tightly packed florets that are backed by petal-like bracts makes the flowers look very much like a star or a firework. 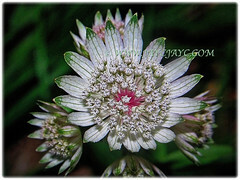 Botanical Name: Astrantia major (syn. 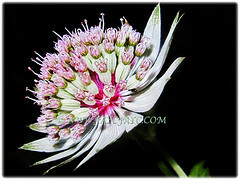 : Astrantia carinthiaca). Common Names: Greater Masterwort, Great Black Masterwort, Melancholy Gentlemen. 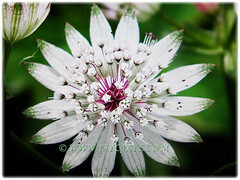 Etymology: The genus name, Astrantia is derived from the Latin word aster meaning star and this refers to the open star-shaped floral bracts of the plant.The specific epithet major, meaning larger or larger, distinguishes this species from its smaller relative Astrantia minor. Origin: Native to central and eastern Europe. It is widely cultivated elsewhere around the globe. Plant type:A perennial and herbaceous plant. 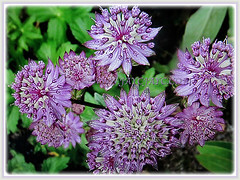 Features: Astrantia major is from the genus, Astrantia that comprises of 8 or 9 species of flowering plants. It is a fast-growing, upright, clump-forming, umbelliferous, stoloniferous and herbaceous perennial growing up to 1 m tall by 45 cm broad. The stem is erect and glabrous with little branches and few leaves. The basal leaves have a long petiole 10-20 cm, 3-5 lobes and serrated margins. The cauline leaves are generally two, sessile, amplexicaul and lanceolate-shaped with a trilobed apex. Its flower stems up to 60 cm tall and bearing flower heads in stalked and compound umbels.The inflorescence is umbrella-shaped and 2-3 cm in diameter. The floral bracts are numerous, about 10-20, 10-18 mm long, reddish and sometimes white with acuminate apex.Clusters of about 1 mm small and whitish-green flowers are surrounded by petal-like bracteoles which are whitish, tinged with green and pink and have conspicuous veining. The central ones are hermaphrodite while the external ones are male. The petals are five, white or slightly reddened while the stamens are five and much longer. This species is quite variable, with flowers from white through to pink, purple and ruby red that are surrounded by green bracts. Seeds are tiny and brown in colour. 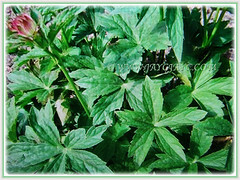 Culture (Care): Astrantia major or Greater Masterwort grows easily with the least maintenance. Light:Best in partial shade though tolerate full sun. Moisture: Moderate water needs. It does not go so well in drought conditions. Soil: Humus-enriched and well-drained soils. Soils must be kept uniformly moist and not allowed to dry out. Others: Cut back after flowers have faded to tidy and encourage a fresh flush of leaf growth and flushes of flowers. Deadhead flowerheads after bloom if self-seeding is unwanted. Moreover, deadheading may also prolong bloom. Generally free from serious garden pests. However, do watch out for slugs, snails, aphids and powdery mildews. For subtropical and temperate regions: Hardiness: USDA Zone 4-7. 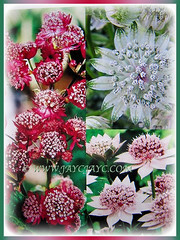 Astrantia major or Greater Masterwort is a frost hardy perennial and herbaceous plant. Best performance occurs in cool summer climates where night temperatures consistently dip below 21°C. It has very pretty half-moon shaped flowers on erect stalks that last throughout summer into early autumn. If you are starting your flowers from seed, you can sow the seed directly into the garden in the fall. In the spring, you have provide some cold stratification to get the seeds to germinate. 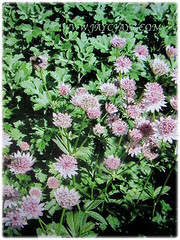 To propagate Astrantia by division, divide clumps in early spring. Flowers may be cut fresh or dried for winter arrangements. Great as cut flower as they are long-lasting. Their flowerheads provide summer colour in shades of red, purple, pink and white. Propagation: Easily propagated by dividing the rootball or from seeds. They self-seed easily too. 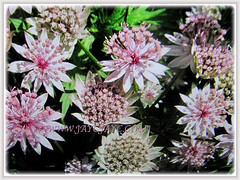 Usage: Astrantia major or Greater Masterwort is an excellent filler plant for a moist area in sun or part shade. Very ideal to be planted in mixed containers or tubs. The plant produces an essential oil that that can be used in herbal medicines. It also contains an amino acid. Their flowerheads provide colour in shades of red, purple, pink and white. Excellent for dried flower arrangements. Shade-loving perennial that is suited in mixed flower bed, mass planting, groundcover and shade garden.